By purchasing plants from Bowhayes Trees you are entering into a legally binding agreement with us on the terms shown below. We advise you to read and understand these terms because they affect your rights and liabilities. The seller, Us or We means Bowhayes Trees (our VAT number is 179 3558 59 and our registered office is at Bowhayes Farm, Venn Ottery, Ottery St Mary, Devon, EX11 1RY). 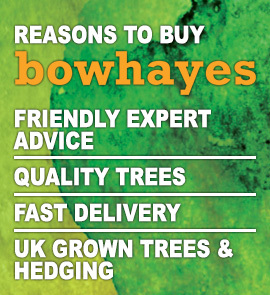 Client, Customer or You means the person who accepts the contract with Bowhayes Trees. Delivery Area means only addresses within the United Kingdom, but excluding the Isle of Man, the Isle of Wight, the Scottish Islands, the Channel Islands, parts of Scotland and Northern Ireland. When the order is accepted through our website an agreement has been made between you and us for the supply of the Goods in accordance with the terms and conditions set out here. The price and description of the Goods are set out on the order page within the website. We try to give you a clear idea of the nature of the plants we are selling. 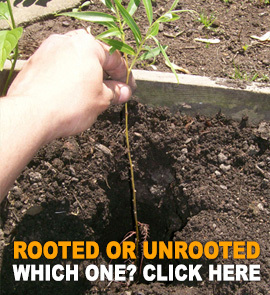 However plants will inevitably vary in size, shape and colours between different specimens. The information, illustrations and descriptions are for guidance only. The quality, quantity and description of Goods will be as per those set out in your order. Orders will normally only be accepted at our discretion, if the Goods are available, if you are based in our delivery area and your credit or account card is authorised for the transaction. If after we have received your order, we discover the plants are unavailable we will try to source them but reserve the right to cancel the order. Our charges for packaging are included in the price shown on the website. Delivery charges will be confirmed at checkout. We will charge your credit or account card upon receipt of your order. We accept no liability if delivery of the Goods is delayed by the supply of incorrect payment details. If we cannot gain full payment for the Goods when the order is placed we can cancel the Contract and delivery. We will take all reasonable care over the safekeeping of all information provided for your order but cannot be held responsible for any loss that you may suffer if unauthorised access to any data, including your credit card data, occurs when you are accessing or placing an order on our website. Delivery will be made to the address given with your order, please ensure this is accurate and please also be clear as to where you would like the Goods left if you are out when we deliver. We cannot accept any liability for incorrect delivery instructions or damage to the Goods as a result. If delivery is delayed for reasons beyond our control, we will contact you to agree a new delivery date. You become responsible for the Goods at the time they are delivered to you, so any subsequent loss or damage is your own responsibility. We inspect plants carefully before despatch but accept that very occasionally things may go wrong. Perhaps they have been damaged during delivery, or even are the wrong plants! The Goods may be returned if they are not what was ordered but agreement must be secured from Bowhayes Trees at contact@bowhayestrees.co.uk before any return takes place. None of our material may be used without our written permission but you may print a copy of pages connected with your order. Unauthorised use of a trade mark is unlawful. 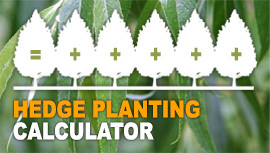 You are fully responsible for care, maintenance and the welfare of all plants after delivery. This contract will be governed by English law and any dispute handled in an English court. We will try to keep the website up to date at all times but the data shown is for your information only. Pictures of plants on the website are broadly accurate but variations in colour, shape and size must be expected from living things. We reserve the right to make changes to this website at any time. We shall not be liable to you in connection with any contract or otherwise for any loss of profit, anticipated savings or data that your business may suffer as a result of our breach of contract. We accept no responsibility for the content accuracy of any websites that are linked to this website.